The drivers of The Yellow Cab of Victoria occasionally find personal items left behind in the vehicles. If you believe that you may have left something in one of our vehicles, please provide us with the following details. • How you paid for your cab ride; by cash or credit card. 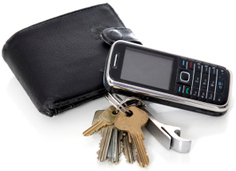 Try calling your cell phone as soon as you discover it is missing. Drivers frequently attempt to return property directly to its owner. So, if you were picked-up or dropped-off at a major transportation hub, including airports and rail stations, try calling the lost and found department at that location. If you were picked-up or dropped-off at a hotel, contact the concierge or security office to see if your property has turned up there. Every time you take a cab ride, take your receipt. Click here to view our lost and found inventory. Click here to submit a lost property report.